Sometime in the past couple of years, Gartner introduced a term called “Shared Accelerated Storage” (SAS) to describe what’s next for the industry after all-flash arrays. I’m not sure when they first used the term, but it was the very first bullet in its 2017 Storage Hype Cycle, indicating its relative newness as a market category. In its Hype Cycle, Gartner has a rather long and complicated definition of what SAS is. The easy way to think about it is that it brings the benefits of network-based systems and direct-attached systems together by leveraging a number of new technologies, most notably Nonvolatile Memory Express— or NVMe, as its more commonly known. In its time, network storage, such as SAN and NAS, was the biggest innovation in storage perhaps ever. It lets businesses share storage, increase reliability, and manage it through software. However, performance can be spotty, it’s complicated to get set up, and it can be very expensive. On the flip side, direct-attached storage (DAS) is fast to deploy, performs well, and is cheap.The downside of DAS is that it's unreliable and unmanageable. SAS brings the simplicity of direct attached and combines it with the scalability and manageability of shared systems. This has been a vision for the industry for decades, but the technology didn’t exist to bring this to reality. Today it does. NVMe over Fabric (NVMe-oF) gets rid of the penalty for moving storage outside the server. With network speeds being where they are today, the latency for this can be reduced to fewer than 10 microseconds, so virtually on par with direct attached. Also, NVMe-oF is much leaner than iSCSI, so the processors in the system can spend more time doing storage-related things versus I/O processing. The net result is a completely stateless compute environment that leverages the fast, reliable shared storage. 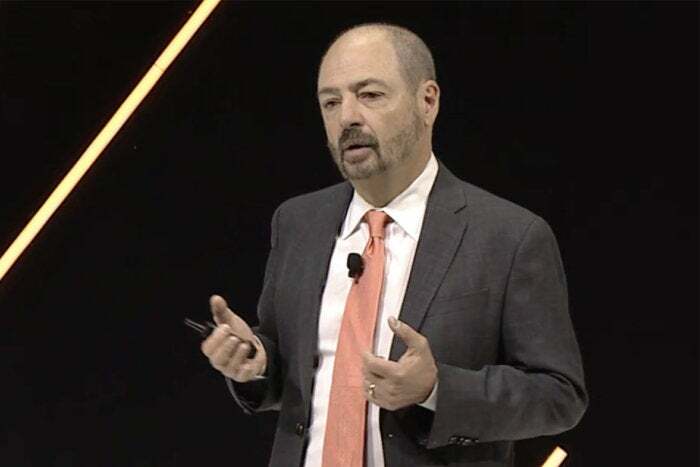 Pure Storage calls this its “Data-Centric Architecture,” meaning the design of the data center will be built around data and not compute or servers. Standardized infrastructure eliminates all the silos that exist and plague data center operations today. Ability to quickly scale compute, storage performance and capacity all independently. Ability to share data flexibly between production, development, analytics and other departments. This enables data to be snap-shotted instead of copied. Snaps are significantly faster than copies, which is more cost-effective and more agile. Self-protecting storage. The storage systems can apply data protection features such as backup/recovery, business continuity, active-active, and others for the apps instead of having to build it into the apps. Simplicity. SAS should greatly simplify the architecture, making it easy to deploy, manage, and scale. Some start-ups and other storage vendors offer SAS systems today, but they have positioned the use case as something above tier 1. I’ve heard it described as tier 0 in some cases, with the commonality being high end, expensive and niche. This is similar to how all flash was positioned years ago. Pure Storage takes a bit of a different approach, as they want to bring it to market now and with competitive price points. If they can do this, the TAM for SAS will be the entire flash market, plus a chunk of the DAS systems, creating a much bigger pie. This week at its Accelerate user event Pure Storage made several announcements that can deliver on the vision of SAS and the Data-Centric Architecture. During his keynote, CEO Charles Giancarlo (pictured above) described data as being the new “gold rush” for businesses, and Pure is delivering the pics and shovels required to mine that data. 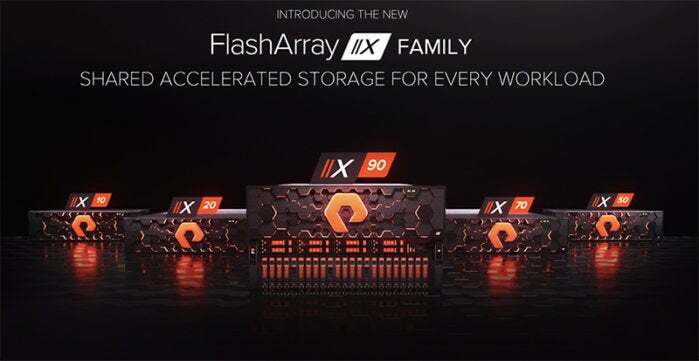 The most notable announcement at Accelerate is Pure Storage's FlashArray X family, which brings shared accelerated storage to every workload. There will be five models, the X10, 20, 50, 70, and 90, which have different performance and capacity characteristics. These can be configured with 100 percent NVMe direct flash architecture, which is about 2x faster than the older all flash M systems. The latency numbers are about 250 microseconds, which is about an order of magnitude lower than flash — meaning better performing applications. The X10 through 70 will replace the existing M10-70 (the X 70 was released last year, but the others are new), but the X90 is its new flagship product. In a 6 RU form factor, the X90 can be loaded with 3 PB of effective capacity. This level of storage is achieved because the compression in the new X series is about 10:1. The highest compression level I have seen from a competitor is 5:1, so Pure’s systems give customers about twice as much effective capacity on the same amount of physical disk. The new compressional algorithms are about 20 percent more effective than Pure’s current technology. This will obviously come standard on X series, but Pure will give it to the current M customers with an Evergreen Gold subscription, so those businesses will see a 20 percent bump in capacity with their next software upgrade. Many companies tend to shy away from the latest and greatest until the price points of the new technology come down. In this case, though, the price points are at parity now. Last year when the X 70 was released, it cost about 25 percent more on like for like capacity (meaning effective capacity, not raw). With this release, the dollar per effective gigabyte price for M and X will be the same, making the decision to buy an X instead of an M a no-brainer. By removing the price barrier, Pure Storage has essentially democratized SAS. Data continues to grow at an unprecedented rate. Success for digital companies depends on being able to mine this data to discover new insights and keep ahead of the competition. Fast networks and processors require fast storage, and the industry has hit a tipping point where existing spinning disk and some flash systems just can’t keep up. NVMe-based SAS is the right solution for the digital world. And Pure Storage’s new X family of storage systems can bring the benefits of SAS to any workload at a price that won’t break the bank, meaning the future of storage is here now.